Director – John Sheppird, Screenplay – Michael Ciminera & Richard Gnolfo, Story – Michael Ciminera, Richard Gnolfo, Jeffrey Schenck & Peter Sullivan, Producers – Fred Olen Ray & Peter Sullivan, Photography – Theo Angell, Music – Andres Boulton & Marc Jovani, Visual Effects Supervisors – Bennique Blasini & Steven M. Blasini, Creature Designer – Hill Vinot, Art Direction – Peter Dang. Production Company – Hybrid/Curmudgeon Films. At Seaside Heights on the Jersey Shore, TC, son of the local sheriff, has broken up with his girlfriend Nooki. TC and his guidos fight with two preppie boys from the local yacht club. The preppies pursue their friend JP who dives into the water to escape – only to be devoured by an albino shark. In investigating, TC and the others are attacked by a shiver of albino sharks. They are disbelieved when they try to alert authorities about the menace. However, people are unable to deny it when a shark leaps out of the water to devour former ‘N Sync star Joey Fatone during a performance. TC realises that the advanced drilling ordered for the building of the new marina resort has created vibrations that are drawing rare albino sharks up from the depths. The mayor refuses to close the beaches on July 4th, whereupon bathers are attacked en masse. TC and the guidos lead the fight back against the sharks – only for TC to realise that Nooki has gone partying with the preppies and is stranded at sea aboard a sinking yacht. The shark attack film was created by Jaws (1975), the success of which spawned a number of cheap copies during the late 1970s/early 80s. In the 00s, the shark attack film washed up in the arena of the low-budget GGI film with the likes of Shark Attack (1999), Shark Hunter (2001), Megalodon (2002), Dark Waters (2003), Red Water (2003), Shark Zone (2003), Blue Demon (2004), Hammerhead (2005), Raging Sharks (2005), Shark Swarm (2008), Malibu Shark Attack (2009) and Bait (2012). 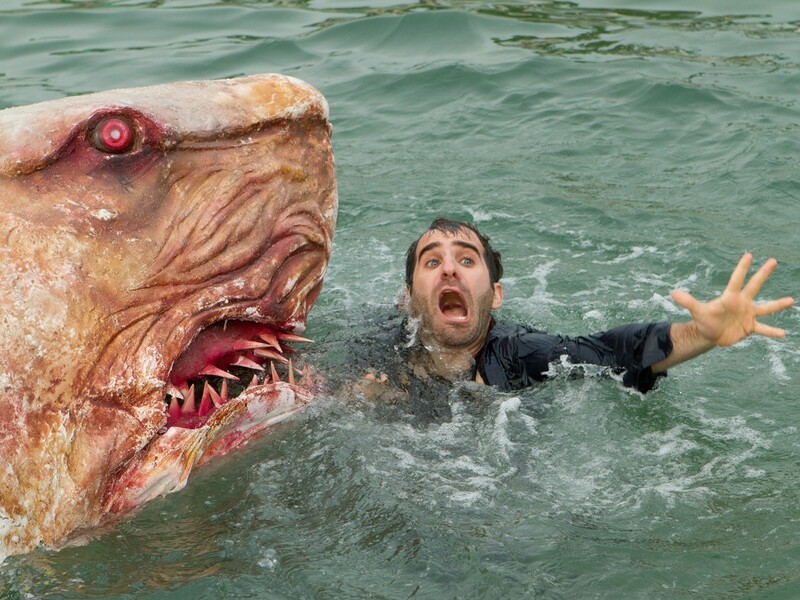 Following the success of The Asylum’s Mega Shark vs Giant Octopus (2009) and in particular Sharknado (2013) and sequels, the killer shark film has gravitated towards the arena of the tongue-in-cheek and wackily titled monster movie with the likes of Shark in Venice (2008), Dinoshark (2010), Sharktopus (2010), Sand Sharks (2011), Shark Night 3D (2011), Snow Shark: Ancient Snow Beast (2011), Swamp Shark (2011), Jurassic Shark (2012), Shark Week (2012), 2-Headed Shark Attack (2012), Avalanche Sharks (2013), 90210 Shark Attack (2014), Raiders of the Lost Shark (2015), Roboshark (2015), Shark Exorcist (2015), Zombie Shark (2015), Atomic Shark (2016), Ice Sharks (2016), Ozark Sharks (2016), Planet of the Sharks (2016), Sharkansas Women’s Prison Massacre (2016) and Trailer Park Shark (2017). Jersey Shore Shark Attack has been amusingly conceived as a conceptual mash-up between a killer shark film and a parody of tv’s Jersey Shore (2009-12), a reality series about a group of housemates in a summer rental home at Seaside Heights on the Jersey Shore. The series became a hit for the hilarious dysfunction and stupidity of its players, and an equal amount of controversy from Italian-American groups for its promoting the idea of guido and guidette culture – guys dressed in a macho manner and girls in an overly trashy way. The film has a character called Nooki who is clearly based on the show’s breakout star Nicole ‘Snooki’ Paluzzi, even wears the same furred ugh boots, while the hero who is nicknamed The Complication is a parody of the show’s Michael ‘The Situation’ Sorrentino. Fairly soon in, Jersey Shore Shark Attack surprises on its low expectations. The film takes its lead from the remake of Piranha (2010) and plants its tongue entirely in cheek. Quite a bit of the running time is spent poking fun at the caricatures of guidos and guidettes (although given the preponderance of Italian names on the credits, one wonders whether this is not so much parody as celebration of a certain culture). There is some hilarious dialogue – Melissa Molinaro’s Nooki is wont to coming out with brain-dead lines like “You’re saying he got drownded?” or when the scene where the guidos discuss how a boat became covered in blood and shrug “It’s probably just spaghetti sauce,” before launching into a monologue about how it is common to take pasta for lunch when going fishing. There are side-splitting pieces about the argument in favour of throwing a power bar into the water to distract the sharks “Nothing is going to resist peanut butter power pack crunch,” followed by the scenes of them trying to despatch sharks by throwing firecrackers. Maybe one of the funniest scenes is the cameo appearance from former ‘N Sync singer Joey Fatone (looking decidedly beefy and no longer a teen idol) who in a completely absurd scene is attacked and devoured in mid-performance by a shark that leaps across a concert crowd and snatches him in its jaws. In a later scene, the shark is caught and an expert is asked to prove it is the same shark that killed Fatone whereupon he reaches into its jaws and produces the microphone. Outside of the humour, the basics of the plot are fairly much a copy of Jaws – the mayor (Paul Sorvino) wants to keep the beaches open because it is July 4th, the greedy developer (William Atherton) who only looks to self-interest, while there are near-identical scenes where the mayoralty sanctions a shark hunt and the wrong one is caught. The scenes of the hero having to conduct a rescue of a girl while she is trapped at sea with a group of teens and menaced by sharks on a sinking boat is one twist that was introduced by Jaws 2 (1978). As with many of the shark attack films listed above, the shark scenes are all represented by cheap-looking CGI – here even the blood in the water is depicted via CGI. Director John Shepphird has mostly made video and cable-released films in a variety of genres beginning with Teenage Bonnie and Klepto Clyde (1993). His other genre works include the sf film Firestorm (1997) and the monster movie Chupacabra Terror (2005).